Bird feeders can bring a lot of joy to not only the birds, but to their human friends as well. The song of a bird is a beautiful melody to hear, and a bird feeder will quickly become a gathering place for birds of all shapes and sizes. A bird feeder should be placed near trees and other objects that provide the birds with some natural cover and nesting areas. Once you begin feeding the birds, be sure to make sure there is always birdseed in the feeder, and that it is kept clean to prevent the spread of disease. There are different types of feeders for different species of birds, as well as those designed for any type of bird that can manage to perch itself on it. 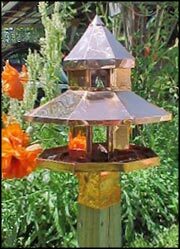 Choose from bird feeders made of woods such as cedar, others made out of plastics, some out of copper and other metals, and other bird feeders made out of resins and stone.